Tonic component: The tonic component is responsible for the slow changes in the GSR signal (from tens of seconds to minutes). In a GSR signal, the tonic level is generally considered the background level of activity on top of which rapid GSR responses appear. The baseline tonic level is very variable between individuals, usually ranging from 2µS to 20µS. It can also vary within the same individual over long periods of time depending on different environmental factors and skin properties. The most common measure of the tonic component is the skin conductance level (SCL). Several studies have shown that changes in SCL can be related to general changes in autonomic arousal, such as general level of emotional state and level of stress. Since SCL changes slowly, the measurement intervals have to be rather long, from tens of seconds to minutes. 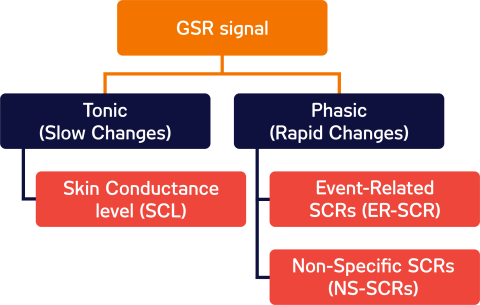 Phasic component: The phasic component is responsible for relatively rapid changes in the GSR signal (order of seconds) known as skin conductance responses (SCRs). SCRs are the rapid fluctuations or peaks that can be observed in a GSR signal. SCRs can be generated as a response to an specific event (e.g., visual stimulus or unexpected question) known as event-related SCR (ER-SCR). ER-SCRs are the most common measure used in research to relate changes in emotional arousal to specific stimuli. One thing to bear in mind when designing experiments that will use ER-SCR as a measure is the slowness of skin conductance responses: they will start from 1 to 5 seconds after the event onset and last for several seconds. A good stimulus design that allows enough time between stimuli is important to avoid uncertainties about which stimulus caused a certain ER-SCR. SCRs also appear spontaneously, not related to any specific event, known as non-specific SCR (NS-SCR). The NS-SCR frequency can vary between participants, with an average of 1-3 per minute. High levels of arousal have also been associated with a higher rate of NS-SCR. NS-SCRs are considered part of the tonic component of the GSR signal. Boucsein, W. (2012). Electrodermal activity. Springer Science & Business Media. Kreibig, S. D. (2010). Autonomic nervous system activity in emotion: A review. Biological Psychology, 84(3), 394–421.